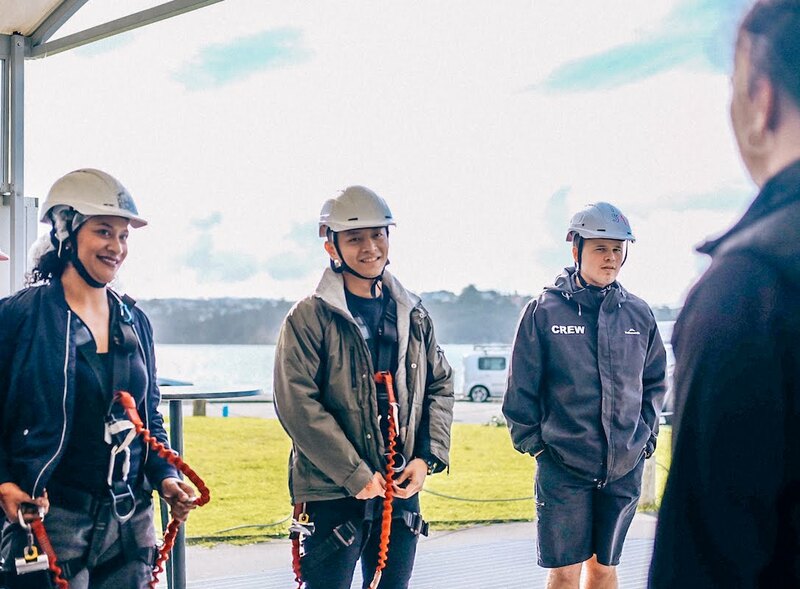 To bungee jump has been a dream that I've kept since I saw a video of this sport so full of adrenaline rush. I know that it is kind of a weird dream for some of you, but for us who are addicted to adrenaline rush, we try to top one experience from another. We can't get enough! Finally that dream came true in Auckland. From the start of my itinerary making, bungy and sky dive were always the main focus. Luckily, the sky was bright on my first day in Auckland. 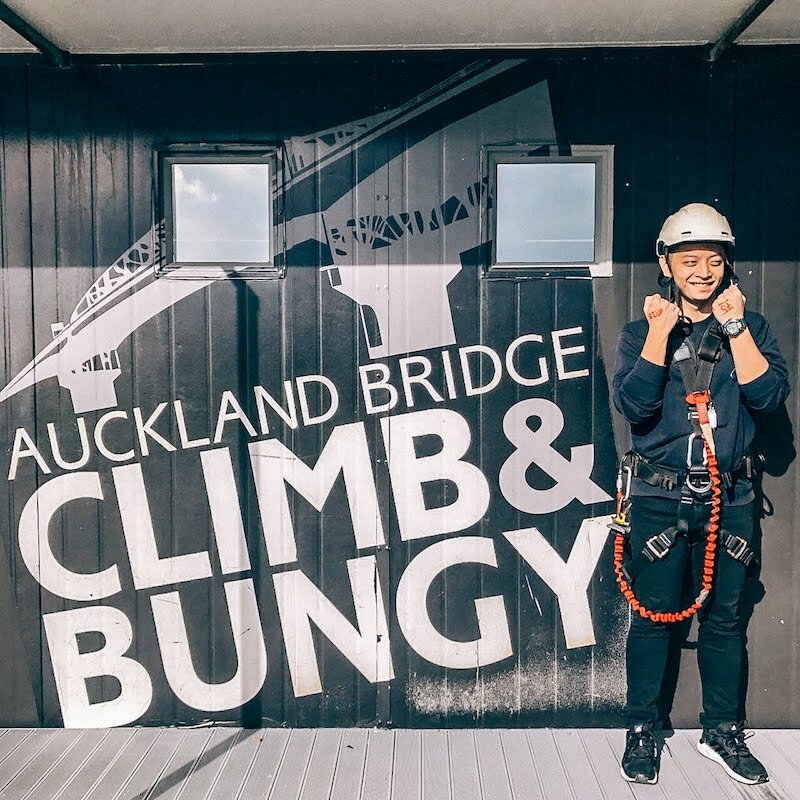 I quickly took the chance to head to Auckland Bridge for my first ever bungy! After waiting for 30 mins, the instructor called us up to gather around for preparation. After having our harness fixed, we were rounded for a quick briefing before we walk to the middle of the bridge. Since this briefing, I had no camera or smartphone with me and I could only describe everything to you in words. The wind was strong and we were advised to wear more layers during the walk to the jumping station. The jumping station was located right below the Auckland Bridge, probably right in the middle. We walked on the bridge with a rope secured to the bridge. 40 meters down below us were open waters, looking at it gave me more excitement to do my first jump ever! Soon enough, they played loud rock and EDM music to pump us up. One by one, each one of us jumped. When my name was called, I was smiling from ear to ear, anxious and excited at the same time. The countdown started and I let myself go. After the jump, I literally wanted to do it again. However, the cost of my first jump was 160 NZD (without video or photo). To purchase photo or video would add me another 45 NZD. So in total, my whole experience costed me 205 NZD. Thanks to AJ Hackett Bungy Jumping for the chance to do this jump. I am looking forward for more jumps before I'm too old to be adventurous! I will be writing about Sky Diving next week! If you can't wait, here's the video of me jumping for the first time!